Are there people out there who don’t love Zendaya? We’ve never met any of them here at HelloGiggles. Just a mere mention of the actress and you’ll hear rounds of “I LOVE HER” — and with good reason. Besides crossing the bridge from child to adult actor with grace, the 20-year-old has also managed to carve a niche for herself in the fashion world. Zendaya’s line, appropriately titled Daya by Zendaya, isn’t the sort of fashion line you’d expect from a celebrity. It’s athleisure-meets-street-style gold. 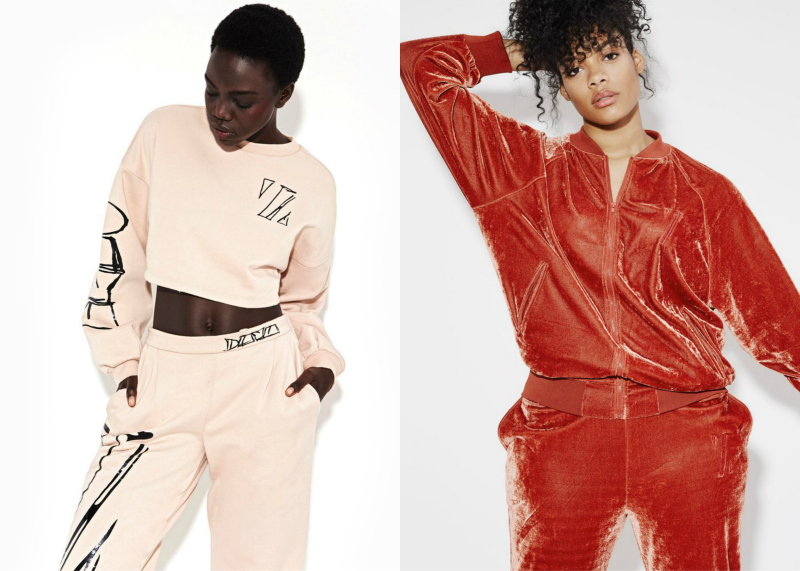 There are vinyl pants, full-length satin slips, silver velvet tracksuits, and graphic flight bombers. And with most pieces under $50, it really seems to good to be true. But thankfully, there’s no catch. In fact, it only gets better from here because Zendaya just released her second collection, Drop 2, and it’s looking to be even better than the last. We spoke to Zendaya about what we can expect from Drop 2, where she gets her inspiration, and what makeup trend she’s really feeling this season. HelloGiggles: Where do you draw inspiration from when you’re putting together the collection? Zendaya: I think of how I’d like to look going out while still being comfortable. I just find comfy materials and clothes that still look cool, and feel comfortable. That’s just my entire life, basically. I was more inspired by colors; the denim, the dark shade of copper, and red tones. The most important part to me is that everyone feels like they’re a part of the process, that they were thought about. HG: What can we expect from Drop 2? Z: I wanted to elevate the line, but in many ways also simplify it. I think there were too many pieces before. For Drop 2, there are more colors and options in that sense, but fewer silhouettes. So that’s a big way in how we simplified it a little bit. I think it looks really good. It’s a little bit more curated and defined. HG: How do you hope the person wearing your pieces feels? Z: I mean, the cliché answer would be confidence, but that’s always true. I want people to feel self-assured in my clothes. I want people to put on my clothes and come out of their shell, to feel like they’re a part of a community and a part of the brand. I want them to feel like they have a piece of Daya, and that they’re a part of the Generation Z brand. That’s important to me. The whole shopping experience has to be a comfortable one. HG: Do you have a favorite piece or look from the collection? Z: I really love the dresses, and obviously the one I wore on the red carpet. I just love all the dresses, they’re all comfortable to wear. You can wear them with sneakers, you can wear them with heels, you can dress them up, you can dress them down. You can wear them with whatever you want! You can wear it with a leather jacket or bomber, there are so many ways to work it. HG: Who are your style icons? Z: My style icons are people who are fearless. I’m not typically inspired by people who are famous. Honestly I do a lot of, I guess you could call it stalking or digging around, just looking at cool people. So I’m mostly inspired by images that come up online, you know? Z: Moisturizer is super important, and personally, I like natural oils. Those work best for my skin. It’s different for different people. HG: What’s your favorite beauty trend right now? Z: The phase of matte lipstick is wearing off. I’ve always been into gloss. I’m a ‘90s baby and that’s what my sister wore growing up. I’m all about glossy everything. Glossy, shiny everything. You can shop the Daya by Zendaya Drop 2 collection here!